TANGO Blue is TANGO’s counterpart of the EPT LuxFibre. From the start TANGO Blue users received a public IP (compare “No public IP for EPT LuxFibre“). 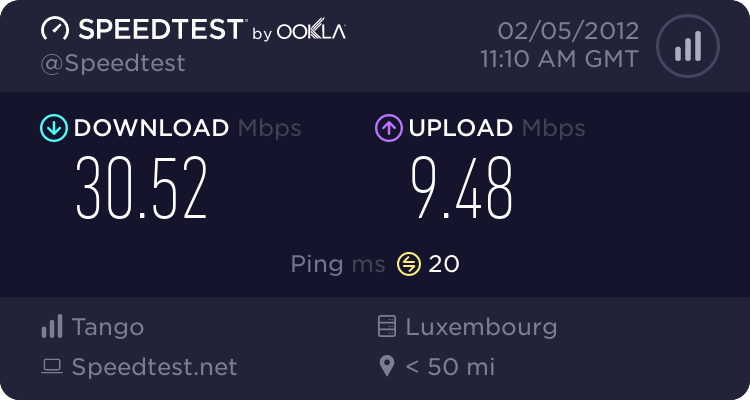 TANGO Blue users weren’t affected by the issues present with LuxFibre. For a while TANGO is now offering an IPTV service on the TANGO Blue access. This combination however provides the user with only a private IP, giving the TANGO Blue+IPTV users the same disadvantages. Several user reports seem to point to TANGO’s CGN, which seems to have difficulties to provide a stable bandwitdh, in some cases reports indicate a reduction of bandwitdh by ~50%. In case you have issues with your TANGO Blue product you should contact the TANGO helpdesk a.s.a.p. i have tango blue without iptv and what i can say is that bandwidth is getting worse and worse… pings to nearby server s are very high… ive been trying to get an answer since “FOREVER” ! seriously i emailed them like a dozen times since 2012 and guess what 0 responses!